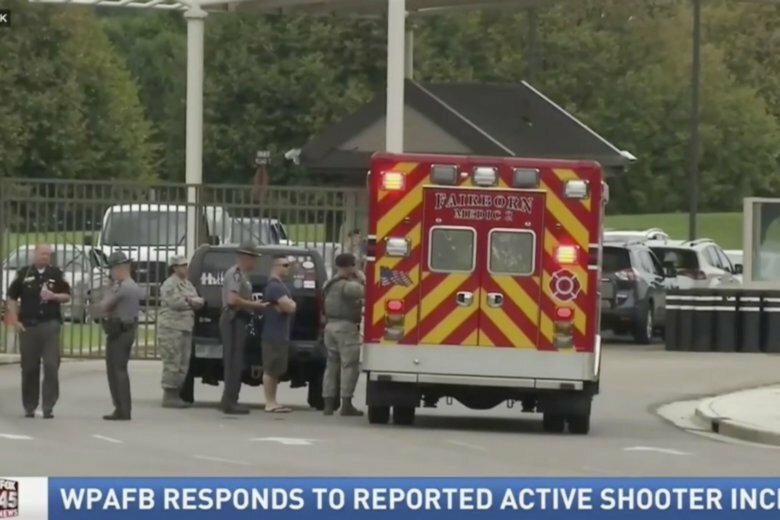 CINCINNATI (AP) — A jogger who called a hospital employee screaming and crying in pain from a twisted ankle led to a series of miscommunications in a chaotic “active shooter” response that sent security forces scrambling across an Ohio air base, Air Force officials said Wednesday. A review ordered by the Wright-Patterson Air Force Base commander following the mistaken alert Aug. 2 found that training exercises that included an active shooter scenario at the base near Dayton resulted in a mistaken call of a “real world active shooter,” a lockdown, emergency responders flocking from state, local and federal agencies, and more 911 calls after sounds of gunshots as security forces shot through a locked hospital door. “A breakdown of communication led to a completely uncoordinated and ineffective combined response that could have resulted in serious injury or property damage,” the Air Force report found. Adding to the initial confusion was a mass casualty response exercise being staged internally at the hospital at the time the injured jogger arrived at the emergency room. The hospital exercise wasn’t linked to an active shooter scenario being practiced at a chapel about a mile away on the base. “This was the beginning of bleed over from exercise to real world events,” the report stated. A call from a hospital desk phone to the base defense center at 12:38 p.m. reported an active shooter, and hospital intercoms declared “Code Silver” for an active shooter and hospital lockdown. Another hospital employee called 911, spurring an emergency mutual aid response from outside police, fire and federal authorities. Soon there were more 911 calls after a base security airman fired his M4 rifle through the window of a locked door so it could be opened. Investigators said five shots were fired, and the airman sustained a minor injury. Lack of communication in the “fog and friction” continued to plague the response. Some 50 mutual aid responders charged into the hospital with weapons drawn, the report stated. Security forces swept the hospital room by room before alerts were canceled. The report said the sweeps showed there needs to be training on how personnel can identify “friendly forces” in such events. The “all clear” came more than two hours after the initial alert. The airman injured when firing his rifle was the only injury reported, and there was “minimal damage,” the report found. It found that firing the M4 wasn’t warranted, and indicated the airman faced “appropriate action” from his commander. Officials cited privacy considerations in declining to identify or discuss individuals’ action, but indicated the major issue was multiple events happening at the same time without good communications about them. “While realism is important in training exercises, all personnel must be always be fully aware of exercise vs. real-world situations,” the report found. Base commander Col. Thomas Sherman said officials began taking steps immediately after the incident to improve communications and will make sure there is more information shared base-wide and with outside agencies ahead of future exercises. Officials said the Air Force requires active shooter training exercises twice a year. The base has some 27,000 military and civilian personnel. The U.S. Navy said a mistake using a mass notification system led to Nov. 27 reports of an active shooter at Walter Reed National Military Medical Center in Bethesda, Maryland. In June 2017, a mistaken report of a shooter prompted the lockdown of Travis Air Force Base in California in the midst of an emergency training exercise.